A wild buffalo in Yellowstone National Park. Photo by William Wyckoff. The Department of the Interior recently issued a plan to reintroduce free-roaming bison across the Intermountain West and Great Plains. This news came with praise from advocates of wild bison and sharp criticism from ranchers who view buffalo and the diseases they can carry as threats to their livelihoods. Here, geographer William Wyckoff provides historical context for bison management in the American West and examines implications of the new reintroduction plan. In late June, the Department of the Interior (DOI) released its long-awaited report on the future of bison management in the American West. As a resident of Bozeman, Montana—only a short day trip from Yellowstone National Park—I know bison management is a dicey topic: in this region, many western cattle ranchers fear that Yellowstone bison will infect their herds with brucellosis. I visited Yellowstone yesterday and the large herds congregating in the park’s Lamar Valley were a focus of continuing fascination for park visitors. Bison herd in Yellowstone National Park. Photo by William Wyckoff. The DOI report highlights the national importance of the Yellowstone bison herds and it is no surprise that the bison plan is provoking a good deal of response all across the West. Authorized in 2008 by the DOI’s Bison Conservation Initiative, the report describes the current state of bison conservation in the West, examines the suitability of additional federal lands as future bison habitat, and offers an initial plan to use Yellowstone Park bison to widely redistribute the animals across the Intermountain West and Great Plains. As I suggest in How to Read the American West: A Field Guide, the West’s wild animals (Feature 18) are powerful cultural symbols shaping how we think about wilderness, open space, and preservation. The DOI report points out, for many Americans, especially Native Americans, bison are especially iconic representatives of an earlier, wilder, more natural West. At the same time, the report is also a reminder that people have been manipulating bison populations for centuries and that recently the federal government has been a key participant in that drama. Just how does this new bison blueprint fit into the West’s larger historical narrative? Bison—once numbering more than 40 million animals—were almost exterminated in the late nineteenth century. Yellowstone National Park became a crucial setting for preserving the species. As park scientists note in an excellent historical overview of Yellowstone bison, exotic animals from Texas and western Montana were introduced into the park in 1902 to supplement remaining wild herds. Several decades of active “buffalo ranching” within the park (which included the interbreeding of local and exotic animals) gradually yielded to the present federal policy of allowing herds (numbering about 4,600 today) to more freely roam, at least within park boundaries. Now—coming full circle—the DOI report suggests it is time for these Yellowstone bison to help repopulate other portions of the West deemed suitable habitat for these animals. The Charles M. Russell National Wildlife Refuge in northern Montana has been cited as an excellent setting for bison relocation and efforts. Photo by William Wyckoff. So where might the bison roam? 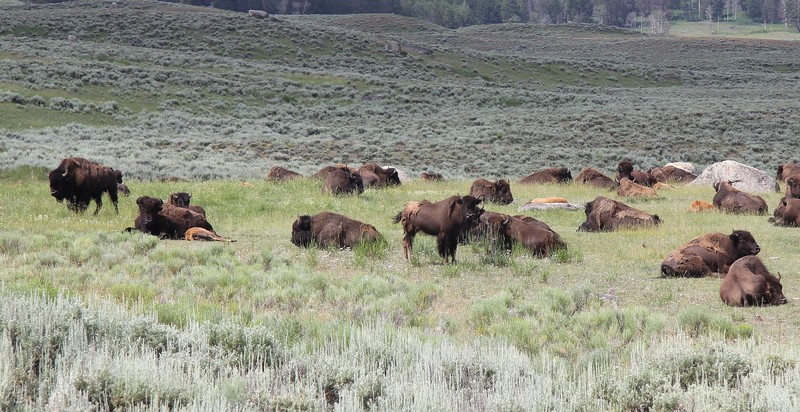 The report highlights twenty settings that may offer new homes for Yellowstone bison. These include other units of the National Park system (such as Badlands National Park, Grand Canyon National Park, and Scotts Bluff National Monument) and a variety of National Wildlife Refuges in settings ranging from Colorado and Montana to Kansas and Nebraska. The report also emphasizes collaborative planning with tribal governments, state governments, and private conservation groups. For example, the Charles M. Russell National Wildlife Refuge in northern Montana (Photo 3) is cited as an excellent setting for bison relocation and efforts and could partner with private initiatives led by the American Prairie Reserve to repopulate bison across a mixed landscape of public and private lands. 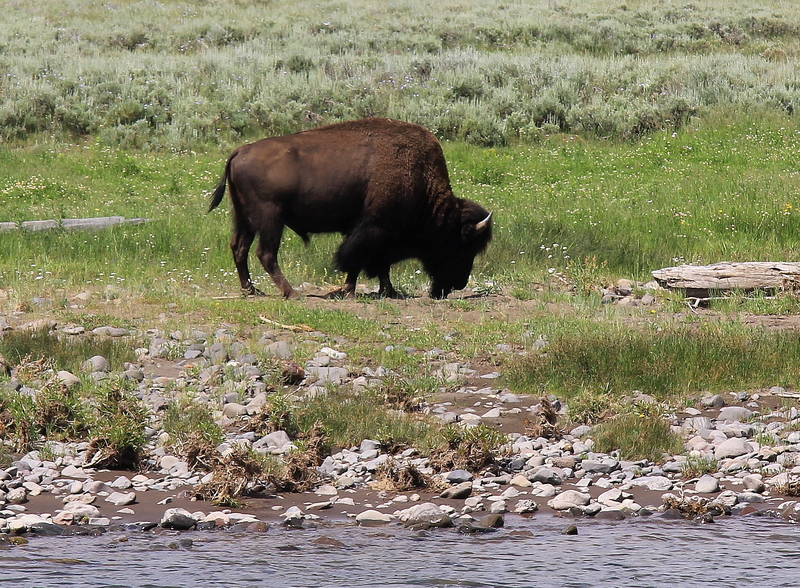 But many western ranchers want to steer clear of Yellowstone bison. For decades, stockmen near Yellowstone have argued that wandering bison threaten their cattle with diseases, especially brucellosis. While current land managers—both public and private—continue to argue about the actual risk of transmission from bison to cattle, the new DOI report suggests there may be a solution to the problem. The report proposes constructing an elaborate quarantine facility for Yellowstone bison that would isolate disease-free animals and their offspring before spreading them widely across the West. Yellowstone’s existing bison management plan suggests initial small-scale quarantines are producing successful results and disease-free animals. Will bison once again roam more widely across the West? It is certainly a laudable goal and this new report suggests a general path for success. Still, the reality of bureaucratic challenges, the complexity of interagency policy making, and the skepticism of powerful ranching interests promise to make this a slow process. Ironically, it is likely to take much longer to repopulate the West with bison than it did to almost annihilate them a century ago. William Wyckoff is a Professor of Geography in the Department of Earth Sciences at Montana State University. His has authored several books on Western landscapes, most recently How to Read the American West: A Field Guide (University of Washington Press, 2014). Wyckoff will be traveling to Washington this week to promote his new book. Catch up with him at one of his events to hear a book talk and slide show that will help you see the West in a new light. Village Books, Bellingham, July 15 at 7:00 p.m.
Seattle Public Library, July 16 at 7:00 p.m.
Ravenna Third Place Books, July 17 at 7:00 p.m. This entry was posted in Current Events, Environmental History, Guest Post, Western History on July 15, 2014 by uwpressblog. AWilliam Wyckoff has posted an article at the University of Washington Press Blog on the potential re-introduction of free-roaming bison to the American West. Wyckoff’s post explores this complicated proposition. At one point, American bison reportedly ranged in North American from Canada to Mexico to the Atlantic seaboard. After being slaughtered during the 19th Century, the American Bison has been making a comeback. Ted Turner manages approximately 51,000 bison over two million acres of his private property in the West, but bison have been restricted from roaming public lands. Western ranchers have repeatedly rejected attempts to re-introduce them to public lands outside of Yellowstone National Park. Their opposition has been been premised on the threat bison infected with brucellosis pose to the cattle industry. Cattle infected with brucellosis frequently miscarry. Still, re-introducing free roaming bison to the American West has been priority for policy makers, Native American, environmental groups and numerous other longtime residents of the West. In many ways, bison are the symbol of the American West and their absence has been missed. The Department of the Interior has released a report that seeks to re-introduce bison to various national parks and monuments and address the concerns of cattle ranchers.